Taupo Lake Adventures Limited offer skippered trout fishing charters and scenic cruises on Lake Taupo, New Zealand aboard our charter boats, Bravado 3 and Te Arani II, operating out of Taupo Boat Harbour. While it is usual to catch trout on a two hour fishing trip, we do recommend trips of three hours or more as we can then take you further out on the lake to enjoy the scenery and more trout fishing opportunities.To catch your trout we offer Deep Trolling with down riggers, Jigging and Harling. We do not operate to a schedule. You charter the boat of your choice for the time and duration that suits you.We provide top quality fishing tackle and complimentary tea or coffee.You are welcome to bring you own food and beverages aboard or we can arrange catered meals to suit your requirements. Your trout will be cleaned and bagged for you to take home or we can arrange to have them professionally smoked and vacuum packed. You can not buy trout in New Zealand but you can take them to almost any restaurant in Taupo and they will cook them for you. While you choose which of our boats you want to charter, we only have one skipper. You will be fishing or cruising with Nick Reed. Nick has been fishing for trout since he was big enough to hold a rod and has been fishing the Taupo fishery since 1987. An experienced skipper, he offers professional, personal and friendly service on our well maintained and presented boats. 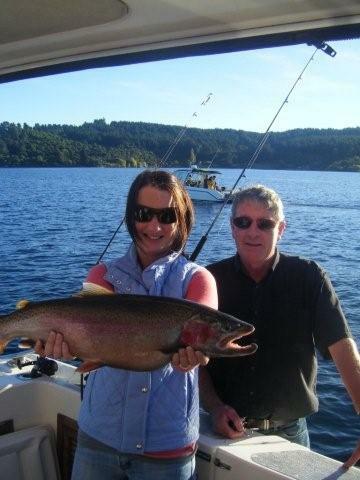 Whether you are cruising or trout fishing, a novice or an experienced angler, with Taupo Lake Adventures, you will have an experience we guarantee you will remember on Lake Taupo. Nick with one happy client.